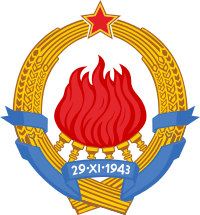 The communist purges in Serbia in 1944–1945 were committed by members of the Yugoslav Partisan Movement and post-war communist authorities after they gained control over Serbia, against people perceived as war criminals, quislings and ideological opponents. Most of these purges were committed between October 1944 and May 1945. During this time, several tens of thousands of people died. The victims were of different ethnic backgrounds, but were mostly Germans, Serbs and Hungarians. Different sources provide different estimates regarding the number of victims. According to one source, at least 80,000 people were executed in the whole of Serbia, while another source states that the number of victims was more than 100,000. In Central Serbia there was some 30,000 victims, while the number of victims in Vojvodina includes about 56,000 Germans, between 20,000 and 40,000 Hungarians, and some 23,000-24,000 Serbs. The names of about 4,000 individual Germans who were killed by the Partisans are known, but it is estimated that many more ethnic Germans were executed. These events during the fall of 1944 are referred to as "bloody autumn" by some sources. In 2009, the government of Serbia formed a State Commission to investigate the secret burial places of victims after 12 September 1944. The Commission compiled a registry of names, basic biographical data, and details of persecution. The registry contains a total of 55,973 names, including 27,367 Germans, 14,567 Serbs and 6,112 Hungarians. The number of victims in Central Serbia is estimated at 30,000. According to Milovan Đilas, before communist forces entered Belgrade, their leaders decided that followers of Serbia's former pro-Axis puppet Government of National Salvation should be liquidated immediately. According to communist leaders, Belgrade was the main center of Serbian reaction and, due to that, it was designed to be "very carefully cleansed from anti-communist elements". The establishment of communist administration was, therefore, followed by a brutal showdown with notable persons that participated in the cultural, political and public life of the German-occupied territory of Serbia, and also with members of the rival Chetnik resistance movement who were defeated in a civil war. During World War II, in 1941, Nazi Germany invaded and occupied Yugoslavia. The Vojvodina region was divided into three occupation zones: Banat was placed under direct German control as an autonomous region within the area governed by the Military Administration in Serbia, Bačka was attached back to Horthy's Hungary and Syrmia was attached to the Independent State of Croatia. Since the beginning of the occupation, the occupying powers committed numerous war crimes against the civilian population of the region, especially against Serbs, Jews and Roma. Therefore, many citizens of Vojvodina belonging to all ethnic groups joined the partisan resistance movement to fight against occupation. The victims of the Axis troops were mostly civilians, while some were the fighters of the partisan resistance movement. Vojvodina was a region with ethnically mixed population according to the various official censuses. At the end of 1944, Axis troops were defeated by the Red Army and the whole of Vojvodina came under the control of the Yugoslav partisan forces. On 17 October 1944, by the order of Josip Broz Tito, the Banat, Bačka and Baranja regions were placed under military administration. About the establishment of this military government, Josip Broz Tito said the following: "The liberation of Bačka, Banat and Baranja requires the quickest possible return to normal life and the establishment of the people's democratic power in these territories. The specific circumstances under which these territories had to live during the occupation, and a mission to fully avert all adversities inflicted to our people by the occupying forces and foreign ethnic elements colonized here, requires that, in the beginning, we concentrate all power in order to mobilize the economy and carry on the war of liberation more successfully". The partisan troops in Bačka had a very strict order, they had to "show the strongest possible determination against fifth columnists, especially against Germans and Hungarians". The term "fifth column" is applied to the subversive and resistant forces and organizations left behind by a retreating enemy. The National Committee for People's Liberation and the Red Army had agreed on the necessary cooperation in due time. Brigadier General Ivan Rukavina was appointed commander of the military administration. He was in constant and direct contact with Tito, the supreme commander. In his first decree, he ordered his troops to "protect the national future and the South Slavic character of the territories" . Although we destroyed the occupying German and Hungarian hordes and drove them back to the west, we have not yet eradicated the roots of the poisonous weeds planted by them... The hundreds of thousands of foreigners who were settled on the territories where our ancestors had cleared the forests, drained the swamps, and created the conditions necessary for civilized life. These foreigners still kept shooting at our soldiers and the Soviet soldiers from the dark. They do everything they can to prevent the return to normal life, preparing, in the midst of this difficult situation, to stab us in the back again at the appropriate moment... The people feel that determined, energetic steps are needed to ensure the Yugoslav character of Bačka. The number of the Serb victims in Vojvodina is estimated at about 23,000-24,000 (According to the professor Dragoljub Živković, 47,000 ethnic Serbs were killed in Vojvodina between 1941 and 1948. About half of the Serb victims were killed by occupational forces and the other half of them were executed by post-war communist authorities). In 1944, in Rajina Šuma near Novi Sad, partisans executed about 200-250 Serbs, who were accused that they sympathized with the Chetnik movement of Draža Mihajlović. They were buried into two mass graves, which were discovered in 1991 during communal works in that area. After entry of partisan forces into Novi Sad in October 23, 1944, by the order of general Josip Rukavina (who was a commandant of military area of Bačka and Baranja), mass arrests of respectable Serbs had begun. They mostly were reputable and rich householders, industrialists and intellectuals, who were seen as a possible threat for the new communist authorities. Order was carried out by the 11th Vojvodinian people's liberation brigade and most of the arrested citizens were executed until the middle of November. Citizens who were executed included dr Miloš Petrović (former mayor), dr Obrad Milutinović (doctor and vice-president of Novi Sad municipality), Dragoljub Ristić (an industrialist), Pavle Tatić (one of the founders of Socialist Party in Novi Sad), Vojislav Matić (editor and publisher of "Nova Pošta" magazine in Serbian language), Miloš Kostić (footballer of FK Vojvodina), Svetislav Vilovski and Đurica Vlaović (members of Serbian Soko society), Milan - Peca Popović (intellectual and member of Rotary club), Jovan Begović (provincial clerk), Aleksandar Silber (economist), Pera Savić (journalist), Fedor Radić (doctor), and Gaja Gračanin (director of "Putnik" agency). Especially tragic fate is that of pre-war mayor dr Miloš Petrović, who was creditable for elevation of monument dedicated to Svetozar Miletić that still stands in the centre of Novi Sad, and who also helped in saving lives of hundreds of Serbs who were imprisoned in concentration camp "Šarvar" during Hungarian occupation. State commission formed in 2009 after thorough investigation made a list of all victims, available on its official site. List includes a total of 14.567 Serb victims. 917 of them are from Vojvodina, and further 101 from Zemun. 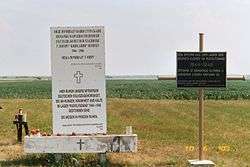 The estimated number range of Germans victims in Vojvodina is between 17,000  and 59,335. According to Friedrich Binder, the total number of the German victims in Yugoslavia was 56,736, of which 240 died while escaping in October, 1944, 8,049 were executed by the Yugoslav partisans and 48,447 died in prison camps from starvation, illness and in the coldness. Serbian State commission formed in 2009 established the list of 27.367 German victims in total. Before World War II, the German population of Vojvodina numbered about 350,000 people. Between 160.000  and 200.000  were left after the withdrawal of Nazi forces. As a consequence of the World War II events in Yugoslavia, the collaboration with Nazi forces and committed war crimes of the German community  the Yugoslav Communist government took a reprisals on ethnic citizens of German origin in Yugoslavia: they had their citizenship revoked, their belongings were taken by force, and they were forced to share their houses with ethnic Serb, Montenegrin, Croat and Macedonian refugees from other parts of Yugoslavia who were colonized in Vojvodina (houses of these refugees in other parts of Yugoslavia were mostly destroyed by German army during World War II). Between 1944 and 1946, a prison camp system was established for all Vojvodina citizens of German origin in almost all settlements where they lived (see also: List of concentration and internment camps, Yugoslavia). In those camps, ethnic Germans were used as slave labor, they were tortured, beaten, and left to die from preventable illnesses and starvation. Some members of the German community were executed by Yugoslav Partisans in those camps. Yugoslav Partisans handed over some of the ethnic Germans to Soviet Red Army, who then took them to Siberia and used them for work in mines as slave labor. Some members of ethnic Germans of Vojvodina were expelled to Germany or Austria. The German victims' memorial in Gakovo. The German victims' memorial at the edge of the old German graveyard in Knićanin, dedicated to those who died of "hunger, disease, and cold", according to the sign. The German victims' memorial in Bački Jarak. The Hungarian victims' memorial in Subotica cemetery, elevated for the 50th anniversary of the executions (1994). Behind: names of victims. 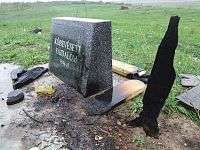 The Hungarian victims' monument in Čurug, shown here damaged. Various sources provide very different numbers of Hungarians executed in Vojvodina at that time. "The Book of Evidence of Killed War Criminals in 1944/1945" published in Yugoslavia states that a total of 1,686 people were executed in Bačka of which approximately 1,000 people were presumed to be Hungarians. However, the estimation of historian Kasaš tells 5,000 executed Hungarians. According to other estimations, the number range of the executed Hungarians in Vojvodina may be between 40,000 and 50,000. Some sources claim that the most probable number of the executed Hungarians in Vojvodina was between 20,000 and 25,000, while others claim that it is about 35,000 (Cseres Tibor gives an exact estimate of 34,491 executed people). Some Hungarian houses were sacked and a number of Hungarian civilians were executed and tortured. Some women and children were raped. Some men who were able to work were deported to Siberia. Some members of Rusyn (Ruthenian) population in Đurđevo were also targeted by partisan forces in 1944. According to Hungarian author Cseres, the majority of the Hungarian population of this village left with the retreating Hungarian army. The Yugoslav partisans then established control over this village and took their reprisals out on the Rusyns and Serbs who were sympathetic towards the Hungarians, the Serbian Royal Government or for their religious views. Several hundred Rusyns were executed and some prominent figures tortured. Serbian State commission formed in 2009 established the list of 40 Rusyn victims in total. In June 2013, members of the Serbian Parliament adopted a declaration, which condemned the massacres and application of the principle of collective guilt against Hungarians in Vojvodina at the end of the Second World War. In response, Hungarian President János Áder apologised in Belgrade for the war crimes committed against civilian Serbs and Jewish people during the Hungarian occupation of Yugoslav territories. Anton Salwetter: Heimatbuch Deutsch-Etschka. Reutlingen-Betzingen 1974. Erika Reusch-Meirer: Sigmundfelder Heimatbuch. Villingen-Schwenningen 1988. ↑ "Politika | Kako su dželati postali žrtve". Kontrapress. Retrieved 2014-06-06. 1 2 3 4 S. Dedeić - V. Arsić. "Press Online :: Vesti dana - politika, skupstina, Srbija, Tadić, vlada, premijer :: Grobnice svuda po Srbiji". Pressonline.rs. Retrieved 2014-06-06. ↑ "Pásztor Bálint honlapja : Parlamenti felszólalások : A szerbek és Szerbia más állampolgárai ellen elkövetett gaztettek elítéléséről szóló parlamenti határozatról és az 1944/45-ös magyarellenes megtorlásokról". Pasztorbalint.rs. 2014-04-16. Retrieved 2014-06-06. 1 2 3 "[sim] Srbe podjednako ubijali okupator i i "oslobodioci"". Mail-archive.com. 2009-01-14. Retrieved 2014-06-06. ↑ "Blic online | Print". Blic.rs. Retrieved 2014-06-06. ↑ "Po kratkom postupku | Ostali članci". Novosti.rs. Retrieved 2014-06-06. 1 2 "Broz na belom konju | Ostali članci". Novosti.rs. Retrieved 2014-06-06. ↑ Zvonimir Golubović, Racija u Južnoj Bačkoj, 1942. godine, Novi Sad, 1991. ↑ Milorad Grujić, Vodič kroz Novi Sad i okolinu, Novi Sad, 2004. ↑ Jelena Popov, Vojvodina i Srbija, Veternik, 2001. ↑ Janjetović, Zoran (2006). "Proterivanje nemačkog i mađarskog življa iz Vojvodine na kraju drugog svetskog rata". Hereticus (in Serbian). 1. 1 2 3 4 Jovanka SIMIĆ. "Proganja misterija iz Rajine šume | Aktuelno". Novosti.rs. Retrieved 2014-06-06. ↑ Dieter Blumenwitz, Rechtsgutachten über die Verbrechen an den Deutschen in Jugoslawien 1944-1948, Sonderausgabe: Juristische Studien, München 2002, S. 64. ↑ Nenad Stefanović, Jedan svet na Dunavu, Beograd, 2003, page 133. ↑ Marie-Janine Calic: Geschichte Jugoslawiens im 20. Jahrhundert, C.H.Beck, München, 2010, S. 179. ↑ Hans-Ulrich Wehler: Nationalitätenpolitik in Jugoslawien, Vandenhoeck & Ruprecht, 1980, ISBN 3-525-01322-1, S. 59f. ↑ "Michael Portmann, Communist Retaliation and Persecution on Yugoslav Territory During and After WWII (1943–50)". Ceeol.com. Retrieved 2014-06-06. 1 2 Dimitrije Boarov, Politička istorija Vojvodine, Novi Sad, 2001. ↑ "Memorial site of the victims". Huncor.com. Retrieved 2014-06-06. ↑ Dragomir Jankov, Vojvodina – propadanje jednog regiona, Novi Sad, 2004. ↑ Cseres Tibor (1993). Serbian Vendetta in Bacska. Buffalo: Hunyadi Publishing. p. 141. Retrieved 2010-10-14. ↑ Kasaš, Aleksandar: Mađari u Vojvodini 1941–1946. (Novi Sad, 1996) Filozofski fakultet u Novom Sadu, Odsek za istoriju. ↑ Karapandžić, Borivoje: Jugoslovensko krvavo proleće 1945. Titovi Katini i Gulagi. (Beograd 1990: Mladost). ↑ Cseres, Tibor (1993). Titoist Atrocities in Vojvodina 1944-45 Serbian Vendetta in Bacska. Hunyadi Publishing. p. 113. Jugoslovensko krvаvo proleće, Sаvo Gregović, Večernje novosti, feljton, 10 nаstаvаkа, 8–17 July 2004. Uništаvаnje srpske elite, LJubomir Tešić, Večernje novosti, feljton, 10 nаstаvаkа, 17. - 26. June 2006. Između srpа i čekićа, Srđаn Cvetković, Večernje novosti, feljton, 11 nаstаvаkа, 14. - 24. December 2006. Beogrаd u mreži OZNE, LJubomir Tešić, Večernje novosti, feljton, 10 nаstаvаkа, 2. - 12. Mаy 2007. Igre kаžnjene smrću, Miodrаg - Mijа Ilić, Večernje novosti, feljton, 18 nаstаvаkа, 13. - 30. Mаy 2007. Grobnice svudа po Srbiji, S. Dedić - V. Arsić, Pres, 7. June 2009.